OK kids it’s (finally) time for what you all have been waiting for: the naked truth about speakers. I will probably make some enemies and lose some readers here. But so be it. Let’s start out by reviewing the goal of this blog: “To discuss producing, in a home environment, a sound field which is indistinguishable from the original live acoustic musical performance from which it was recorded”. That’s important because if your goal is something other than this, what I have to share here may not be very helpful. We have already spent some time discussing the space where your speakers will reside. For now I’ll limit my discussion to a classic 2 speaker (system) stereo in front installation. Speakers 101 is a prerequisite for Speakers 102, 103, 104 etc where we might cover more exotic installations. But we first need to understand some basic characteristics that a speaker system needs in order to convince you that “you are there” or “they are here”. This does not mean “better” or “worse” sounding. Those are subjective. The Holy Grail here is accuracy: A sound field which is indistinguishable from the original performance. We are out to deceive your brain. Audio sleight of hand. Factoid #1: Audio is not wine, people. There is nothing a speaker does that can not be scientifically measured in such a way to give a real picture of its ability to accurately generate a sound field in a given environment using the original performance as a basis of comparison. If one prefers to make measurements by virtue of biological transducers (listening with our ears), a “double blind” test is a perfectly acceptable substitute. Factoid #2: A perfect copy of the original sound field is not required in order to be completely convincing. Thank your aboriginal brain for this. A few years ago Acoustic Research decided to do some marketing promotions where they invited listeners with all levels of expertise to a concert which featured a stage and musicians along with a pair of AR3’s which were, at the time, their best loudspeakers. The musicians would play a passage live and at some point stop at which time a recording of the same musicians (done in an anechoic environment) was fed through the loudspeakers. The listeners were then asked to identify the live Vs. recorded passages. Can you guess what the listener’s responses were? Some said they could identify a subtle difference in the sound between the two passages but were unable to come to a consensus of which were live and which were recorded. Howcum? Our brain has a poor ability to recall the details of a sound out of context. We can identify the roar of a saber toothed tiger. But the timbre or articulation of his roar is not relevant for survival. No different with a cello or piccolo. We can identify them. But beyond that it becomes tres difficult. More on this later. I digress. Suffice it to say that a perfect audio copy of what is being fed to the speaker, while very preferable, is not a requirement. Factoid #3: The laws of acoustics (physics) have not been repealed. There are a ton of manufacturers out there that claim their stratospherically priced products incorporate some new technology which makes all previous designs obsolete. Hokum. You are certainly entitled to buy what ever it is that floats your boat. But be advised, there is no connection between how a speaker system looks and how accurate it is. Um, well, maybe there is a little connection. The more a speaker system looks like a sculpture or a space ship, the less likely it is to be accurate. And the more likely it is to empty your wallet. Factoid #4: The number of drivers (speakers) in a system is a poor indicator of accuracy. Indeed the old engineering axiom which instructs us that simpler is (almost always) better is very much in keeping here. The only things of importance to be convincing are how smooth and to a smaller extent how wide the overall frequency response is, how linear the dynamic range is over the loudness required for the material in the given listening space, and the uniformity of the spatial dispersion pattern. Factoid #5: There are many ways to arrive at the same metaphorical place. Speaker systems use many different driver and enclosure designs. They all work to one degree or another. Some better than others. From a purely theoretical perspective, they all seek to emulate a mass less pulsing sphere: an isotropic (point) source which radiates a wave front of any audible frequency equally in all directions. But who cares? Which is the best design and manufacturer and model? How do I tell? This brings us back to Factoid #1. By looking at the “specs” , one can determine the best choice. But a trip to your local audio purveyor is so much more fun. So let’s go. Really. Not to worry. We’ll do this together. Any idea where was that picture above taken? 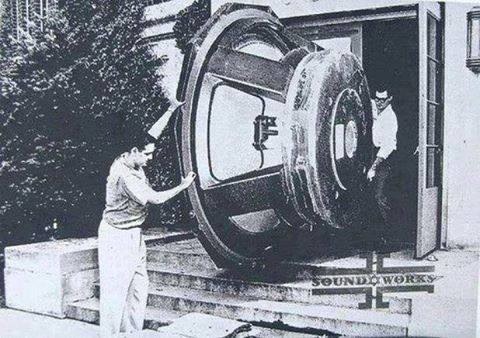 Because when I went there back in the early 70’s, WPI had what their audio engineering department claimed was “the largest (6′) speaker cone in existence” in a special chamber down in the basement of the EE building & this kinda looks like it. That sucker went down to 6Hz & they wouldn’t let anyone in the room when they pushed it that low… something about low frequencies and sphincter muscles. Oddly, they did have what looked like a dentist’s chair in the same chamber… I’m not making this up.